Thanks for writing in! Please review our knowledge base section and go through our resources (https://theme.co/apex/forum/t/knowledge-base-overview/287). Foe example, following guide would be a good starting point (https://theme.co/apex/forum/t/cornerstone-content-builder-introduction/118). There's a slight different in the latest versions as the UX/UI improved. 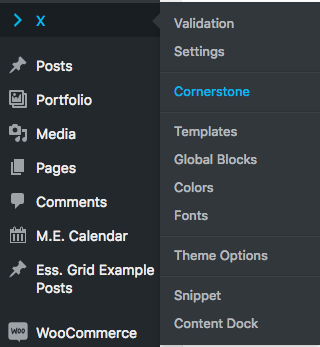 Now you can access the Cornerstone builder using WordPress admin bar. Or using the X menu as follows. 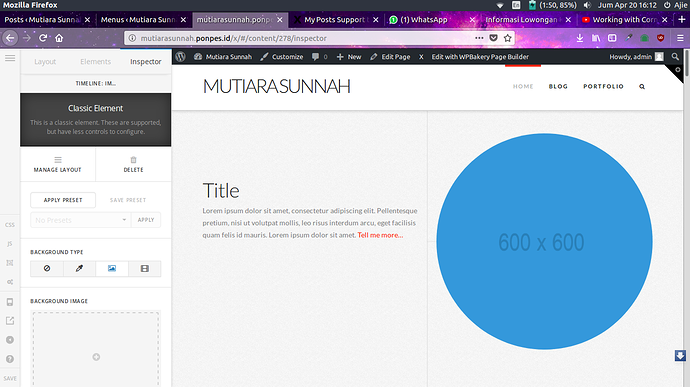 Also when you're in a particular page, you can edit a page using Cornerstone using the admin bar as well. i can acces it, but i cant edit it. even change the text,, theres no option to do that. Is it possible submit your site URL along with your WordPress credentials in a secure note to check your issue. You can see the secure note option below your posts. Yes, that's right, we got your login details, Thanks. If you can't do that via your browser, please try disabling your browser add-ons/extensions and recheck this issue,alternatively, you can use incognito mode in Chrome or another browser for testing. im using mozila and ad block. it must be chrome y? Slider is there; please clarify. Use the Classic Revolution Slider element if you want to add an slider that you created on Revolution Slider, Classic Revolution Slider will not show a preview on the editor, but it will show up on the front-end. Use the Classic Slider element if you want to create a basic slider directly on the page.